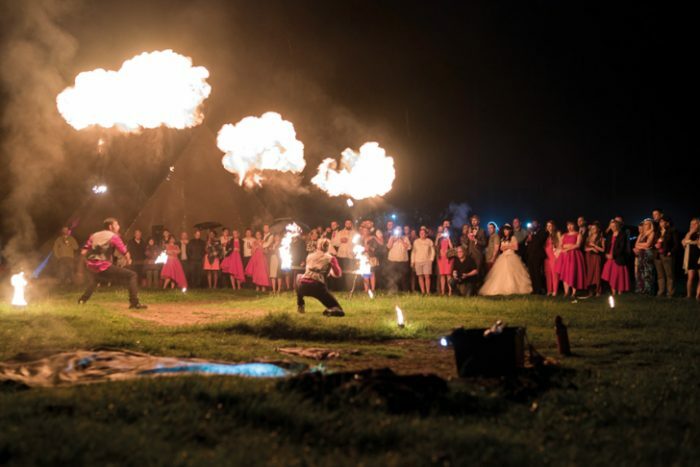 Everyone knew that the wedding of Troy and Kim Oakley-Duffill was going to be unique – and their guests wouldn’t have expected anything less. 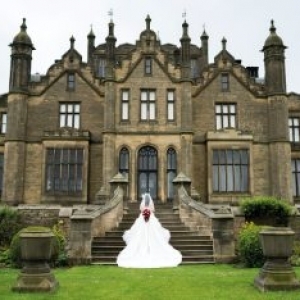 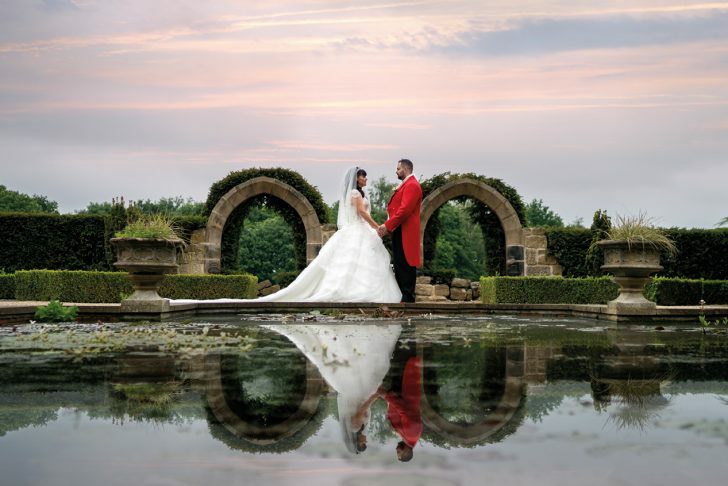 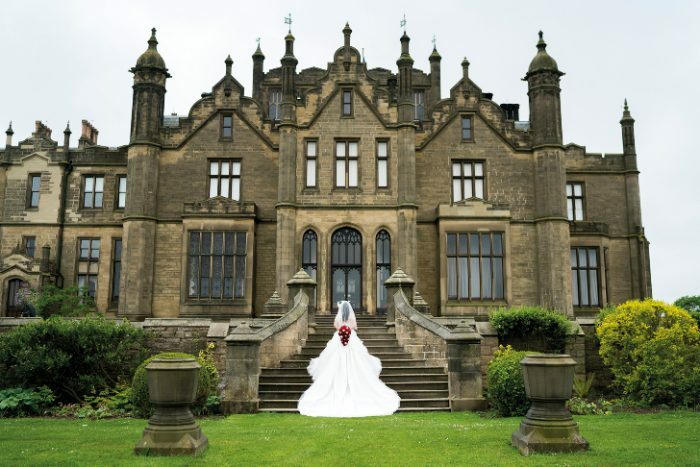 The couple, who both work as performers, were married at Allerton Castle near Knaresborough, which is an elegant Gothic stately home which uses a staircase as a dramatic wedding aisle. 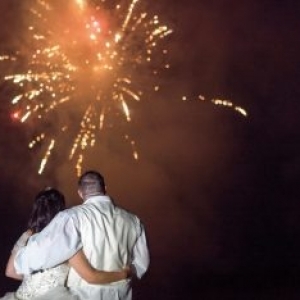 Troy and Kim tied the knot in a ceremony on June 11 this year in front of nearly 80 family and friends. 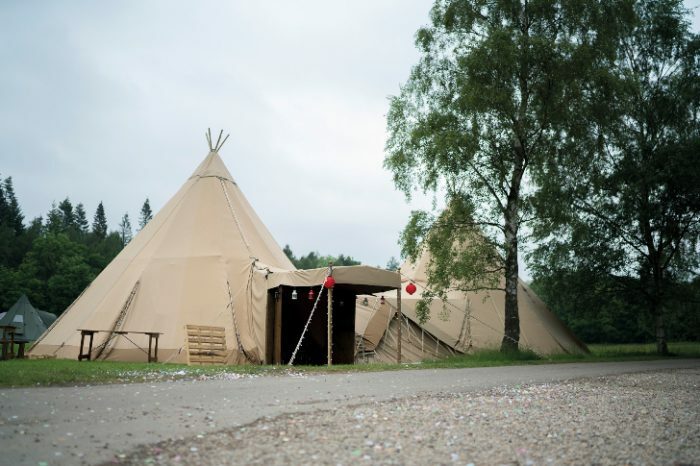 Following the service, they enjoyed a woodland reception with a difference at Camp Hill Estate in Bedale, North Yorkshire when most of the guests camped overnight in the popular glamping and camping venue. 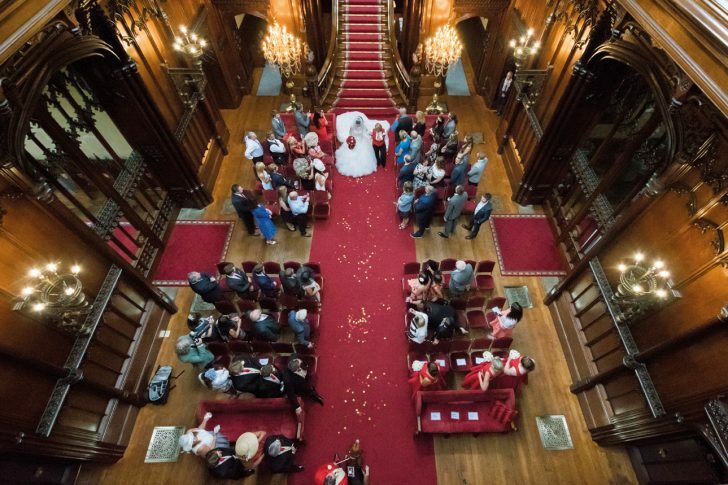 After the couple had read their own quirky vows, they danced a flash mob in the regal settings of the castle. 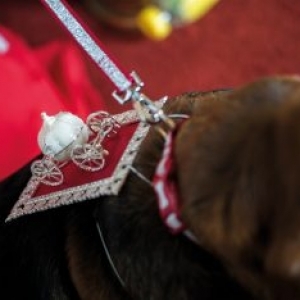 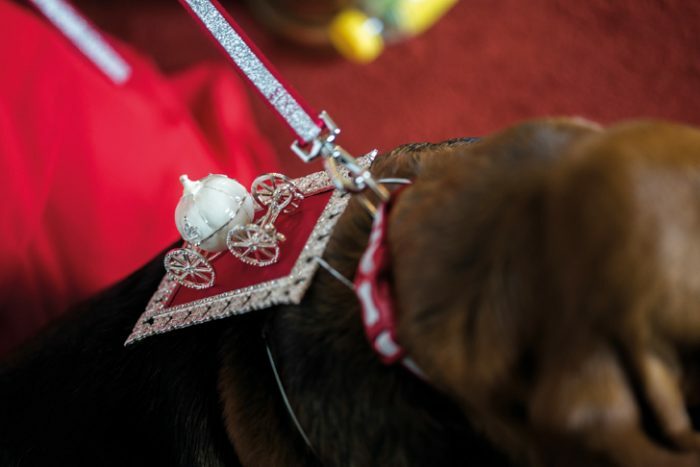 Other unusual aspects of the service included having Kim’s 84-year-old grandma Doreen Oakley as the flower girl and the family dog Dave, a Bassett Hound, as the ring bearer. 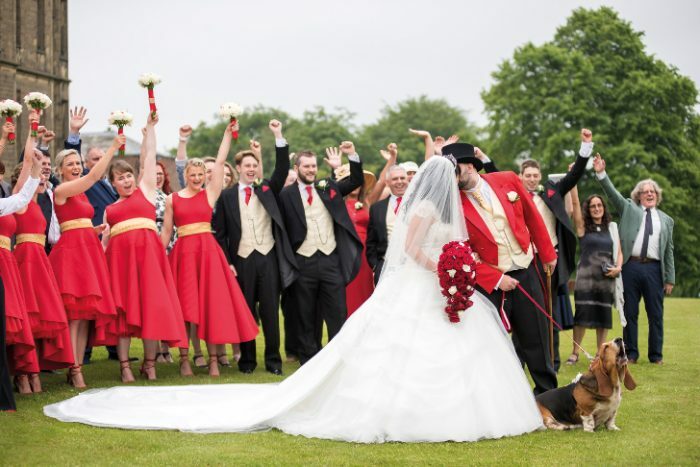 “The only thing that almost went wrong on the day was that the dog shook just before the music started to play for the walking down the aisle and the wedding rings flew out. 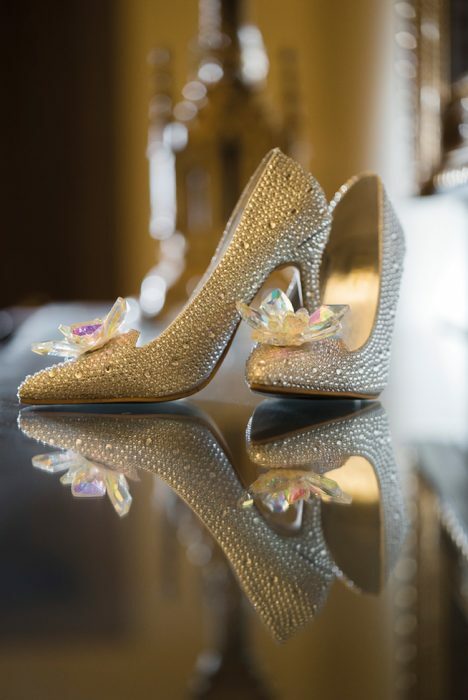 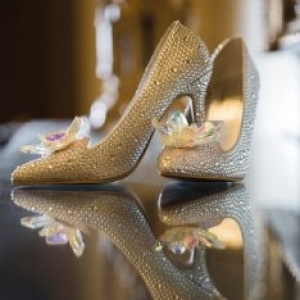 Seconds before he walked down the aisle they were found! 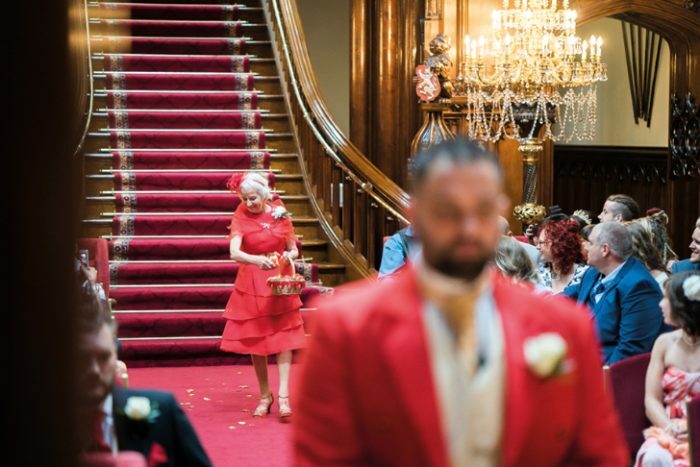 For the ceremony Kim wore a Disney Princess style ballgown in pale ivory with a cathedral train, and carried a teardrop bouquet of red and white roses. 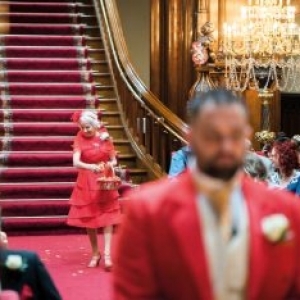 Her five bridesmaids had red and gold gowns, in keeping with the whole circus theme of the day, and carried posies of similar flowers. 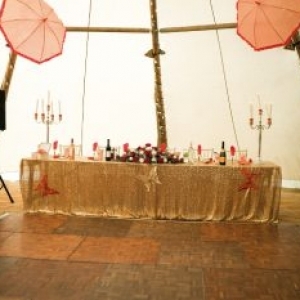 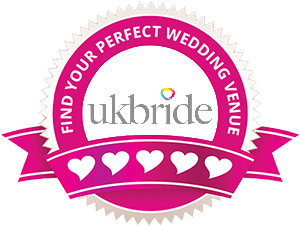 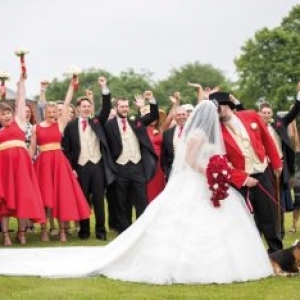 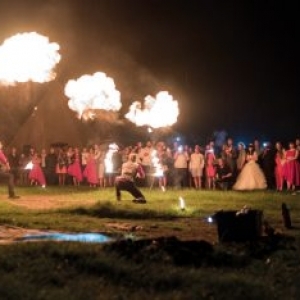 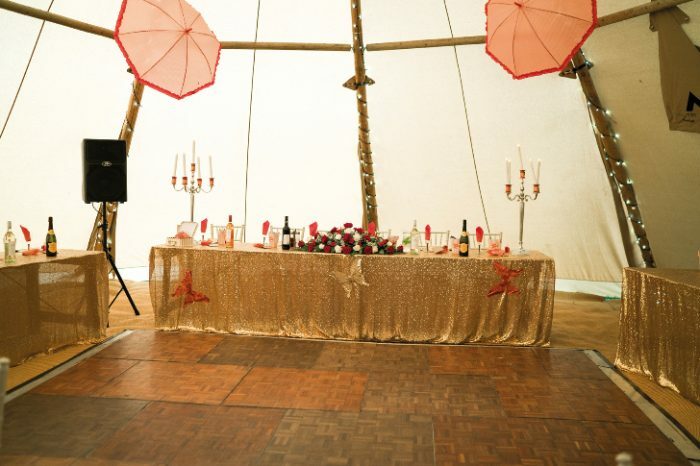 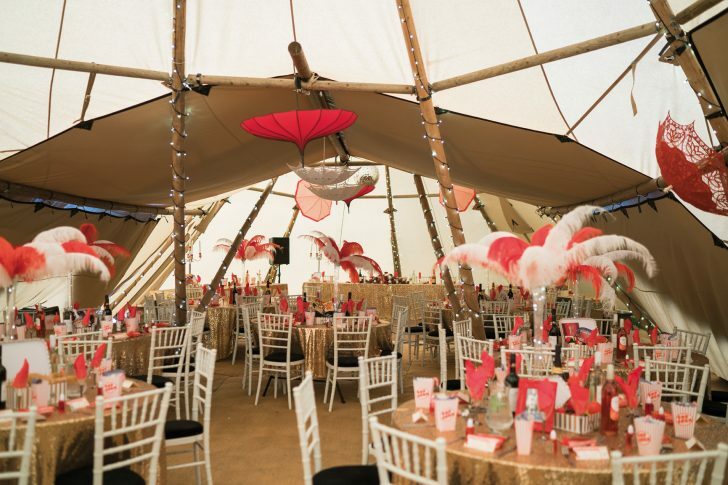 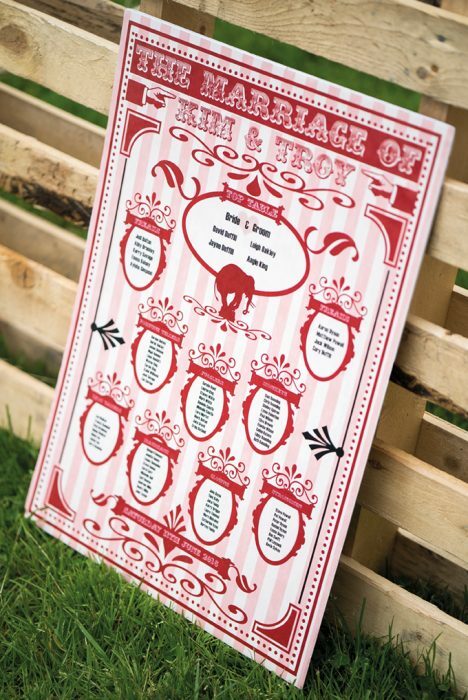 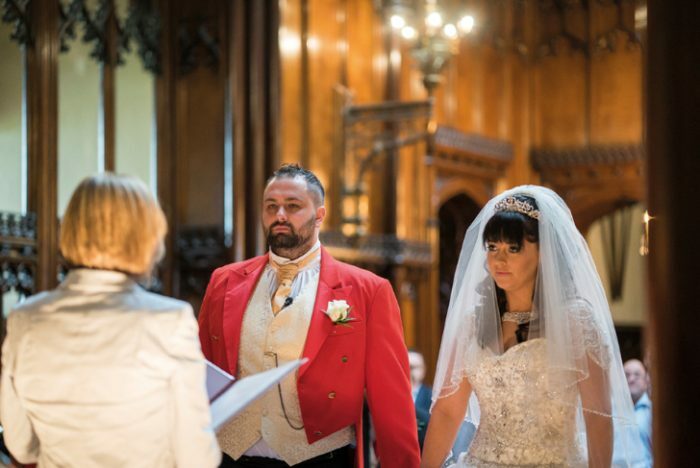 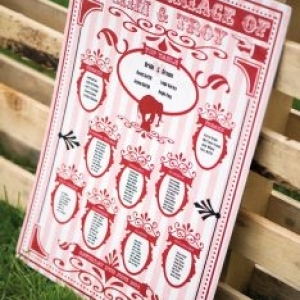 Once at the reception venue, the real circus theme kicked in with magicians, jugglers, fire eaters, a bouncy castle, evening firework display and much more to keep all the guests entertained, as well as a wedding breakfast of pie and chips. 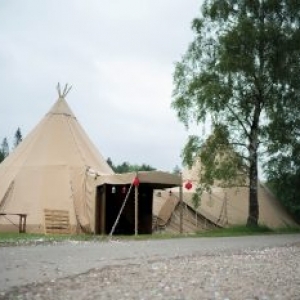 There was also a hot tub available all day and night and a large decorated Tipi style tent. 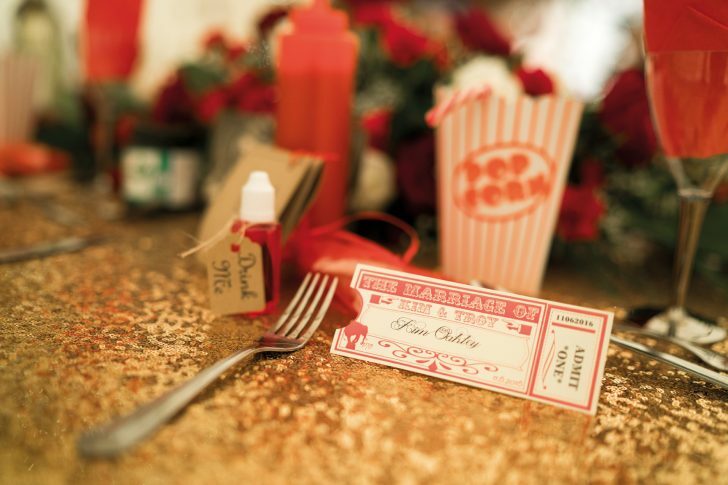 Another 70 guests joined the fun in the evening when food was provided by a burger van and a sweet buffet and music from a live band. 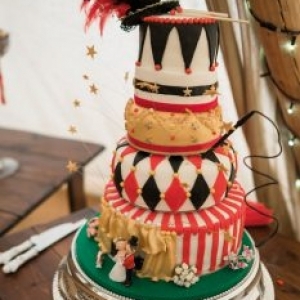 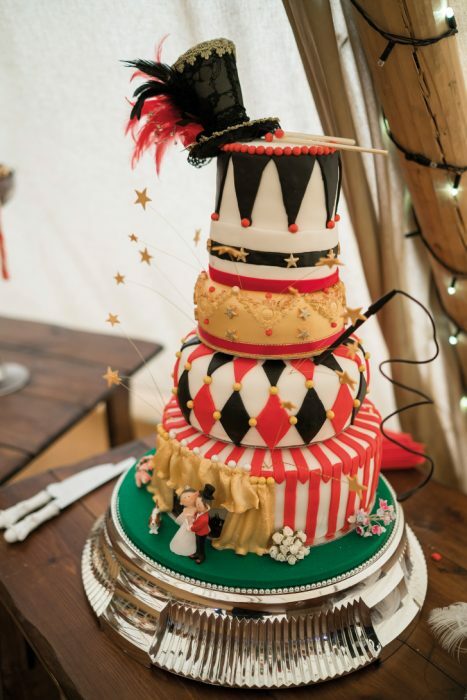 A circus themed four-tier wedding cake, made by the bridegroom’s mother, was a great talking point with figures of the bride, groom and pet dog on top. 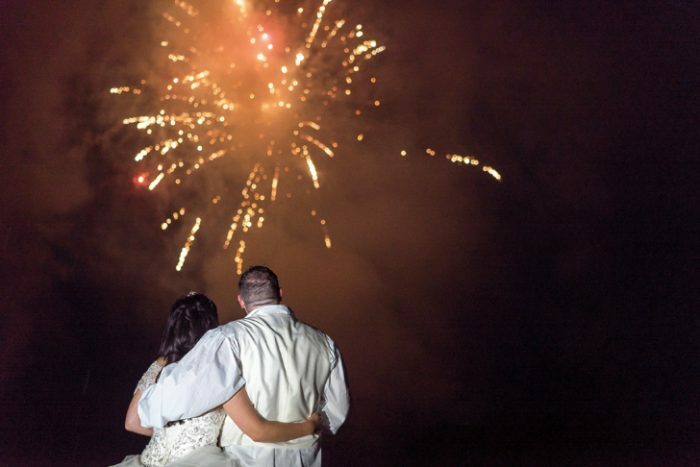 After their unique wedding, the couple enjoyed a honeymoon in Las Vegas and Mexico. 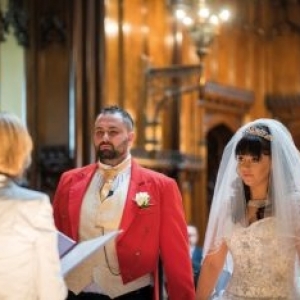 Life is now settling back to normal at their marital home in Doncaster, although this is currently in the process of being extended.